Property Size 990 sq. 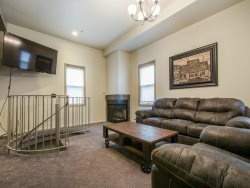 ft.
We offer free Wi-Fi, free covered parking, free maid service every other day in winter, once in three days in winter and a huge free continental breakfast (winter only). Park City, Utah is host to a plethora of recreational, cultural and night life hot spots and with Salt Lake International Airport only 35 miles from The Blue Church Lodge you could be skiing or snowboarding by the same afternoon as check in.